I love the Today show and listening to my youngest daughter sleeping in. Since we had such a busy week, she should sleep until 10 which gives me a very quiet, enjoyable morning with my coffee and T.V.!! 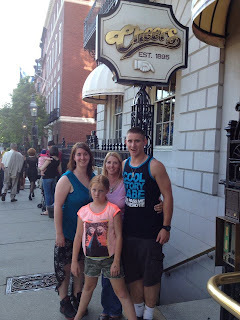 I had so much fun visiting Boston for the first time this past week. It's sad that my oldest graduated and this was the 1st time I'd been there! :( I was simply unable to afford it before now with finishing college myself, starting a new career, and moving to a new town! I will definitely be going back however because she will be living there! She looks exhausted, graduating is exhausting! Especially when you have family to show around,a room to pack up and of course senior partying to do! 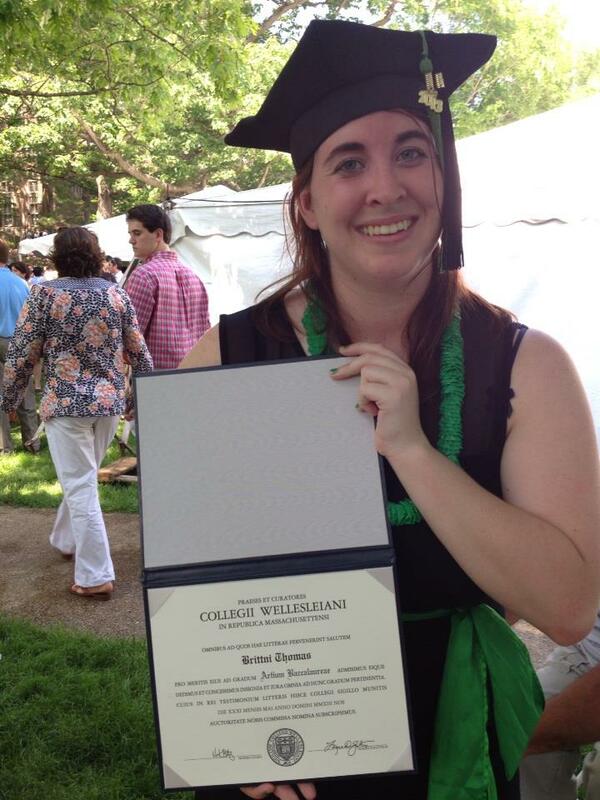 Her diploma is written entirely in Latin which we are assuming is an Ivy league thing!! ;) Mine certainly isn't! I am so proud of her and can't wait to see what the future holds for her! Of course we had to visit Cheers! I used to love that show and watched every episode!! As you can see, my youngest isn't happy but that is pretty usual for her! We have a growing collection of pictures that show her with unhappy faces that I plan to put together in a photo book when she is 18 and graduating herself! She gets so mad that we laugh at the pictures but continues to look like that so I figure it is well deserved! My mini-vacation to Massachusetts was AWESOME!!! I do believe that in order to recuperate and re-organize, I will simply stay home and in my PJ's all day! After running around from 6am to midnight for almost a week I am exhausted...pooped...plum worn out!! Good thing there is nothing I absolutely have to do today! My goal for this summer...to make at least 10 new products for my TPT store! I have been offered a 3rd grade position for next year so I will need some new things for my classroom! I'm not completely sure what will happen as I have applied other places also but I know that I need my TPT as a supplement! I have to start looking into new curriculum and plan to make things to reflect whatever new position I end up with! Let's get physical! Ha! I just completed (almost) the 30-day squat challenge and my lower half feels much stronger! Let me just tell you how glad I was that I had done this prior to walking all over Wellesley and Boston! I was sore but I know it would've been so much worse! So my next challenge is to work my way up to running a 5K! I desperately need the cardio and hopefully it will firm up some other areas!! I love how this app slowly walks you through it 3 days a week for 30 minutes a day! 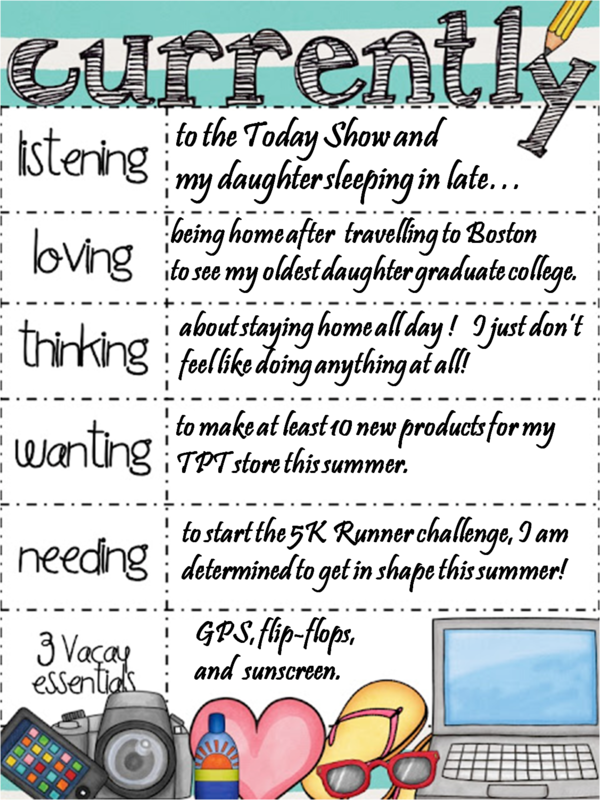 Having just returned from vacay I can say with experience that my 3 essentials were a GPS,flip-flops and sunscreen! I have no idea what we would've done without the GPS telling us where we needed to go. Boston is a big, bustling city and this slow town girl isn't used to driving in all of that! I got lost with the GPS so...just imagine what could've happened without it! Ha! If you will be visiting a place that is new to you, I strongly recommend you have one!! Flip-flops...the most comfortable walking shoes ever!! Whether you are walking the beach (where I live) or the city, you can't go wrong with a good pair of flops! Same with sunscreen, city or beach its HOT out there! Stay covered so that you can enjoy yourself! A sunburn is no good and if you get one the first day...the rest of your vacay will be a bust!! Well that's it for my Currently! I can't wait to see what everyone else is up to this month! I loved watching the show Cheers and still watch it in reruns. I taught third grade for a couple of years and I really liked the age group. Now, I am teaching 4th grade and think I will stay because I enjoy the curriculum. Goodluck on finding just the right position for you! WOW! Congrats to your daughter!! It looks like a great trip.